This article appeared in the Winter 2008 issue of Texoma Living!. You know a thing or two about road trips when you’ve been planning them for thirty years. 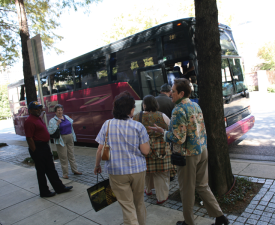 On Vickie White’s first charted motor coach excursion nearly that long ago she took a group of seniors, not the ones in high school, to St. Augustine Texas. The bus made an unusual three stops for ice of all things. The group wanted to mix drinks, the ones with alcohol. She had no idea people drank during the day! White has learned a lot about people and traveling since then. She’s been all over the world taking adventurous people with her. Besides the exotic trips to Europe, cruises through the Mediterranean and tours all over Asia, she plans day trips. For the novice, a little explanation; sure it starts in the morning and ends in the evening but it is what is in the middle that has the lure. A typical trip begins with an early wake-up call. On this particular outing—a November week day, the Texoma Tours bus left Albertson’s parking lot at 8:30 in the morning. With microphone in hand, White described events of the day with poise and wit all the while standing in the isle, holding onto the top luggage rail. For $99 the itinerary included; The Dallas Museum of Art for the world renowned King Tut Exhibit, lunch and shopping. The sold-out bus ride went by quickly as people talked and laughed. Some of the group were regulars—repeat customers— which made it easy to reminisce about previous vacations and chat up the next big trip. The bus arrived curbside at the DMA no problem. How nice not to deal with traffic and parking which costs anywhere between $9 to $15 and $30 for valet. Once inside and through the holding pattern of the masses, the group moved leisurely through the exhibit well within the one-hour time allotted. The exhibit was nothing short of fascinating. The Chocolate Angel Cafe & Tea Room in Richardson was next on the agenda, for lunch. The charming restaurant not far off Highway 75 made for a practical choice. A few boutique shops within walking distance were a big hit for most of the women. Before long, the bus was boarding for the return trip. All in a day’s work for White who has one rule: If a customer proves themselves to be a difficult traveler, her next trip they inquire about will be full—not to be confused with sold out. 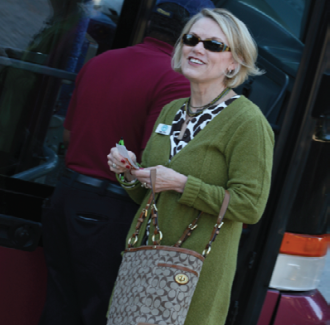 Dee Lough of Travel Partners in Sherman also offers motorcoach excursions from the area to Branson, Missouri. Lough says the draw for people is convenience. All the planning is done; you get on the bus and go. Everything from meals, to show tickets, to lodging is included for around $529 per person. 2202 N. Loy Lake Rd. Drive across the Red River Bridge from Denison into Oklahoma without paying a toll, and you have State Representative Jake J. Loy to thank. Go fishing or to a livestock show at Loy Park, and you have County Judge Jake J. Loy to thank. You can even listen to a recording of trumpet player Tommy Loy, and you can thank a doting Uncle Jake J. Loy. It is a quiet place hidden away in an office block off North Travis Street in Sherman, so the amount of rowdy school spirit that comes out of the place is surprising. Daron Holland owns Hollands Logo; as a native and lifelong resident of Sherman he bleeds maroon and white.